416-SL2825 Features: -Self locking mechanism allows blade to be extended smoothly. -Push button allows blade to be retracted smoothly. -Nylon coated blade for maximum durability. -Impact resistant rubberized case. Product Type: -Tapes. Dimensions: Overall Product Weight: -0.83 Pounds. Tough Enough For The Toughest Contractor, These Tapes Feature Superior Blade Extension, Smooth Speed Locking Device, Easy To Read Blades With Stud Markings And Reinforced Triple Riveted End Hooks. Features A Nylon Coated Blade For Long Life. 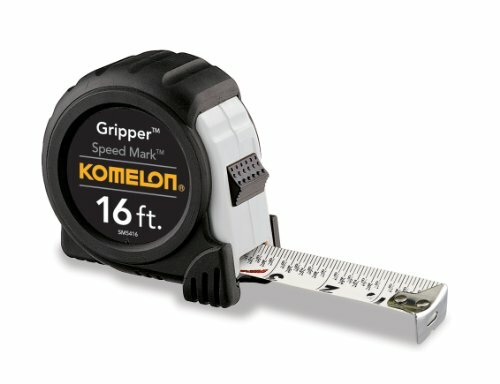 Back in 1999 Komelon came out with the Gripper and its design was revolutionary. We took this design one step further and added our Speed Mark fractional graduations to the blade. The 16-Feet Gripper Speed Mark has an easy grip, thick rubber jacket surrounding its ergonomic compact case. The blade on the Gripper Speed Mark is acrylic coated and has fractional graduations printed on the blade making it quick and easy to read. 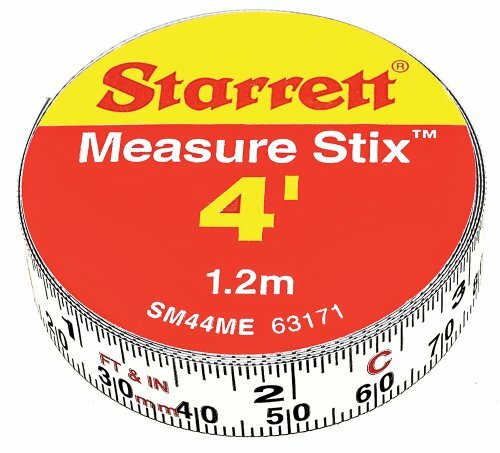 When you reach in your tool belt for a tape measure, make sure you feel the Gripper Speed Mark because everything else is substandard. 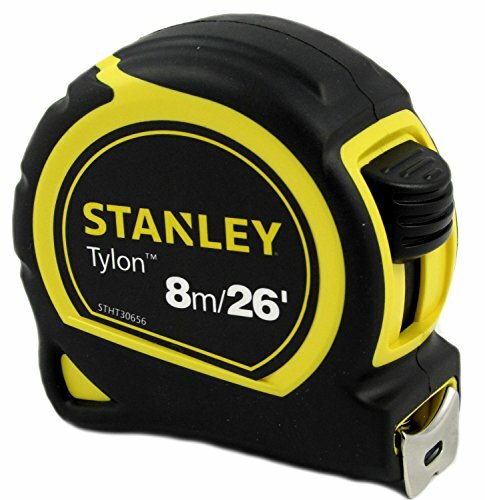 Amazon.com The Stanley 30-Foot-by-1-1/4-Inch FatMax Measuring Tape is reinforced on the first six feet with BladeArmor coating for maximum durability. A Mylar polyester film extends the life of the entire blade. This tape rule comes with a cushion grip built into the case for a non-slip grip and impact resistance. A top forward blade lock design makes it easier to lock and unlock the blade while a heavy, heat-treated spring provides long life and smooth blade recoil. Tape Rule is reinforced with BladeArmor coating for maximum durability. See the full line of Stanley tape rules. Hand tools for the pro or expert enthusiast. view the FatMax product demo (requires Flash) The tape blade measures 30-foot-by-1-1/4-inch with a 11-foot tape standout. To simplify framing jobs, the bright yellow, easy-to-read blade has 16-inch and 19.2-inch stud center markings. It comes with Stanley's limited lifetime warranty. About Stanley FatMax Tape Systems and BladeArmor Coating The FatMax family of products has established itself as one of Stanley's most extensive and innovative product families in the company's 161-year history. The FatMax line of hand tools features core tools essential for the pro or expert enthusiast who desire high quality, durable tools. BladeArmor coating is a patented industrial thermoplastic coating, the very same material that has been used to strengthen and protect aircraft parts, such as the rotor blades on the Sikorsky Black Hawk Helicopter. Simply put, it helps aircraft survive war zones, and it also helps tape blades survive construction zones. Applying BladeArmor coating to tape blades reduces both tape breakage and tape returns, enabling it to conquer the toughest testing ground of all -- the job site! 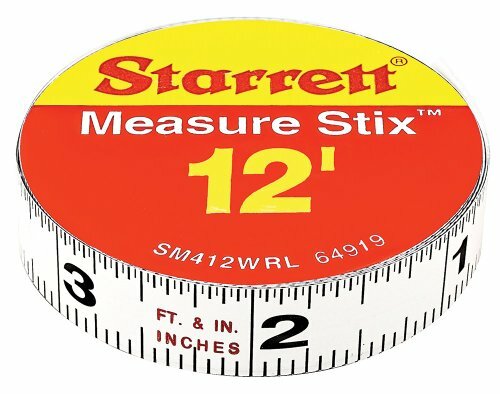 The Stanley 30-Foot-by-1-1/4-Inch FatMax Measuring Tape is reinforced on the first six feet with BladeArmor coating for maximum durability. A Mylar polyester film extends the life of the entire blade. This tape rule comes with a cushion grip built into the case for a non-slip grip and impact resistance. A top forward blade lock design makes it easier to lock and unlock the blade while a heavy, heat-treated spring provides long life and smooth blade recoil. Tape Rule is reinforced with BladeArmor coating for maximum durability. See the full line of Stanley tape rules. Hand tools for the pro or expert enthusiast. 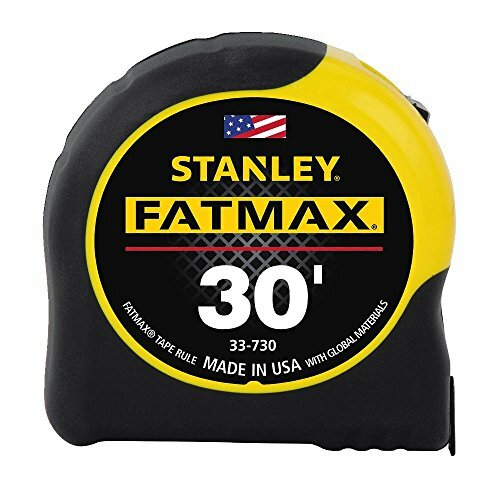 The FatMax family of products has established itself as one of Stanley's most extensive and innovative product families in the company's 161-year history. The FatMax line of hand tools features core tools essential for the pro or expert enthusiast who desire high quality, durable tools. BladeArmor coating is a patented industrial thermoplastic coating, the very same material that has been used to strengthen and protect aircraft parts, such as the rotor blades on the Sikorsky Black Hawk Helicopter. Simply put, it helps aircraft survive war zones, and it also helps tape blades survive construction zones. Applying BladeArmor coating to tape blades reduces both tape breakage and tape returns, enabling it to conquer the toughest testing ground of all -- the job site! Mylar polyester film extends life of entire blade chrome high-impact ABS case is job site tough secure blade lock won't creep during measurements 16" and 19.2" stud center markings simplify framing jobs corrosion-resistant tru-zero end hook for accurate measurements length: 16' WIDTH: 3/4". 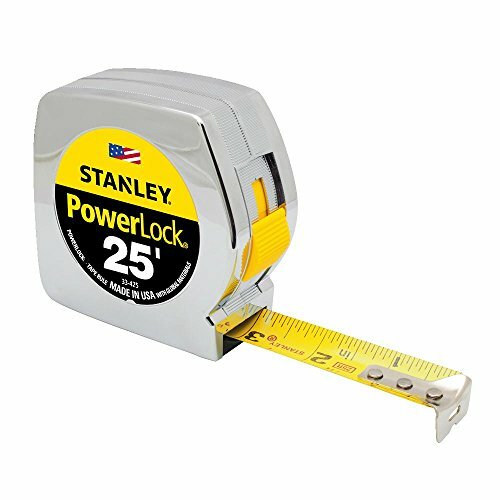 The Stanley 16-Foot Powerlock Tape Rule provides positive blade lock with no creeping. A special Tru-Zero hook does double-duty as a pivot for drawing circles and arcs. 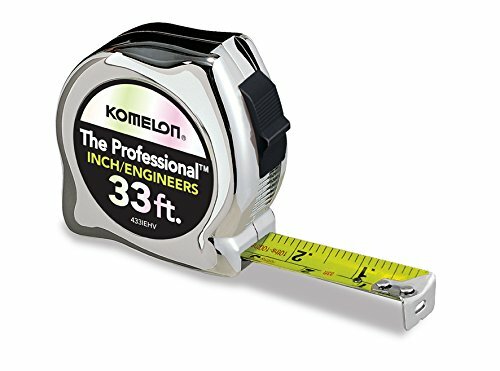 For longer life and durability, this tape measure features a Mylar polymer-coated blade, a heat-treated spring, and a chrome-plated metal case. 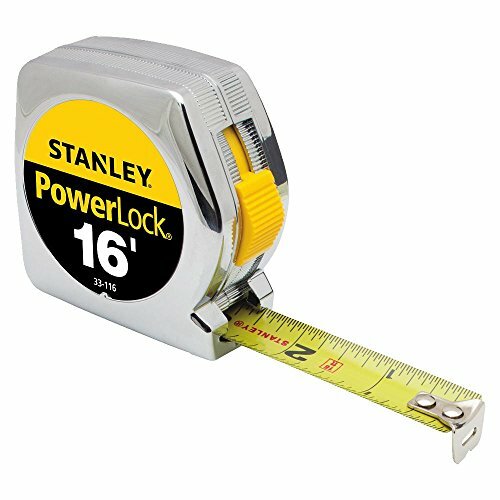 With a classic design and updated features that add durability and performance, the PowerLock line of tape measures is the perfect balance between classic Stanley design and the best innovations in tool manufacture. Back in 1999 Komelon came out with the Gripper and its design was revolutionary. We took this design one step further and added our Speed Mark fractional graduations to the blade. The 25-Feet Gripper Speed Mark has an easy grip, thick rubber jacket surrounding its ergonomic compact case. The blade on the Gripper Speed Mark is acrylic coated and has fractional graduations printed on the blade making it quick and easy to read. 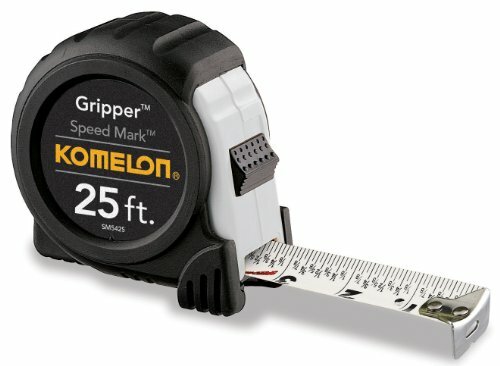 When you reach in your tool belt for a tape measure, make sure you feel the Gripper Speed Mark because everything else is substandard. Stanley tape blade is coated with Mylar polyester film for durability. Secure blade lock. Stanley 33 series. The Stanley Works, originally a bolt and door hardware manufacturing company located in New Britain, Connecticut; was founded in 1843 by Frederick T. Stanley. A few years later, in 1857, Frederick s cousin, Henry Stanley, founded The Stanley Rule and Level Company. In 1920, The Rule and Level Company merged with The Stanley Works and would go on to become it s famous Hand Tools Division. Over the years, The Stanley Works has produced some of the most innovative and useful tools ever made. Among these tools are the Bailey Plane, the Surform shaper, the PowerLock tape rule and most recently the FatMax line of products. Today, more than ever, Stanley continues to be an industry leader in tool innovation. In 2001, Stanley introduced more than 100 new products, bringing to 400 the number of new products introduced in the past four years. As a direct result of Stanley s commitment to excellence, Stanley was awarded the Prestigious Golden Hammer Award, presented for New Product Innovation in both 2000 and 2001. A Functional One That Makes Measuring Work A Breeze! We always put our customers first. Our elite support team offers 24/7 support. Anytime you have any questions, we will be more than happy to help you out. Unlike traditional 25ft measure, this one has a 27ft long blade. It's better to have the length and not need it than to need it and not have it, especially when it's at an affordable price. The 0.14mm thick reinforced steel blade with ultra wear-resistant coating is sturdy enough to enable 8ft horizontal standout and 13ft vertical standout, eliminating blade deforming or hook rivet falling off to the extreme. While the corrosion-resistant matte coating makes it much easier to read when in a well-lit area where reading gets impacted with strong light reflection. 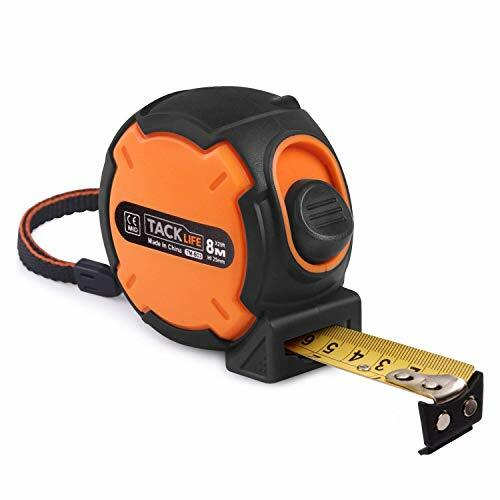 Besides its shockproof compact core and tough constructed ABS frame, this tape's exterior has a molded hard rubber covering that prevents shatter or damage to the tape when dropped, protecting your measuring tape for as long as you need it. VERSATILE WITH MAGNETIC HOOK - This easy-to-read double sided electrician ruler metal measure tape with fraction can stick to any ferrous material with the powerful magnet tip, which greatly enhances the stability of the blade, especially when measuring a really long distance. The magnets are also strong enough to double the tape as a magnetic pick up tool. These make it a perfect tool for engineer, architect, etc. Where's My Tape Measure? 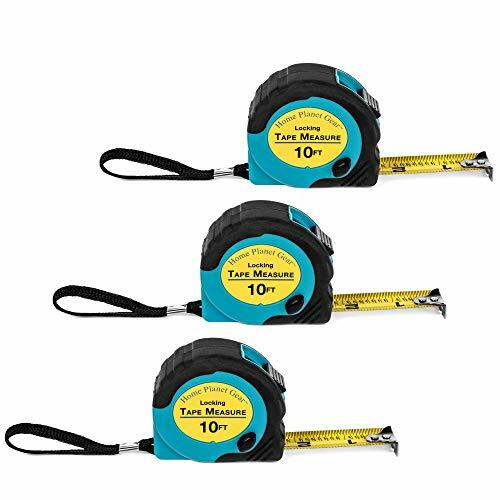 - 3 Pack of 10 ft, Locking, Retractable Auto-Wind Measuring Tapes with Fractions. Accurate, Easy to Read & EASY TO FIND! 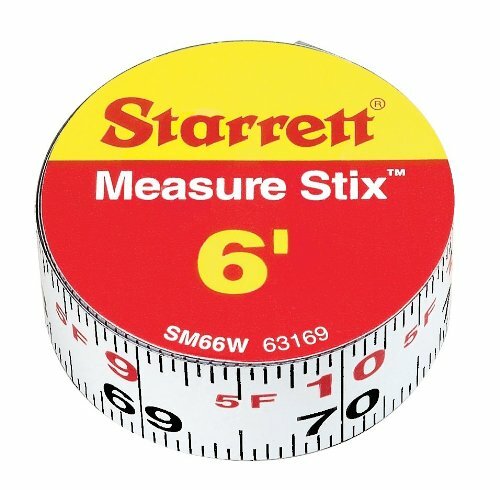 Tired of looking around for your measuring tapes? WHERE S MY TAPE MEASURE? THREE PACK - So there s always one around! Perfect for construction and carpentry, hobby and crafts, DIY, around the house, car glove box, purse, tool kit, kitchen or office drawer. Easy to read with feet, inches and fractions to 1/32, marked every 1/8 in. plus 16 in. and 19.2 in. stud markings. Quality Built to last with impact-resistant ABS case, non-slip rubber bumper grips, nylon polymer bonded flexible steel blade. Case housing: 2.5 in x 2.5 in x 1 in Medium duty blade: 5/8 in. Standout to 4 ft. Easily locks with sliding thumb lever or pause with one-touch side button to hold tape. Auto retracting with smooth rewind. Sturdy metal clip to keep it handy, but it fits in your pocket too! Stop wondering Where s My Tape Measure? and Get Your 3 Pack Today! THREE MEASURING TAPES, so you can always find one! With accurate, easy to read feet, inches, fractions to 1/32, 16" & 19.2" stud markings. WHY GET A THREE SET? Surveys say tape measures are like potato chips - one is never enough! Value pack MAKES A GREAT GIFT! QUALITY MADE, DURABLE impact-resistant ABS case, non-slip rubber grips, nylon polymer bonded flexible steel blade. Compact housing: 2.5 x 2.5 x 1 Blade: 5/8 Standout to 4 ft. DESIGNED to fit comfortably in your hand. Sliding thumb lever locks position. One-touch side button holds position. Auto retracting, smooth rewind. Sturdy belt clip. 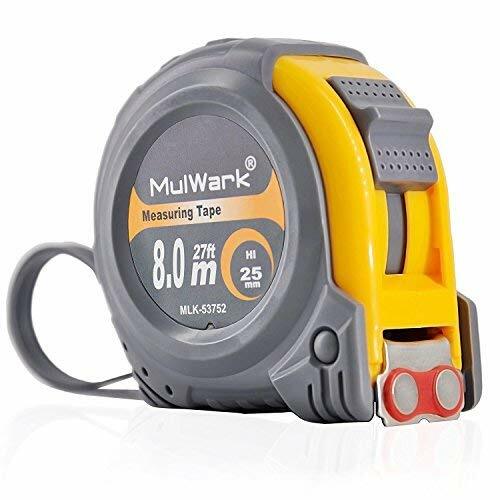 100% SATISFACTION GUARANTEE - If you aren't completely happy with your Where's My Tape Measure tapes, we will replace or refund your order, no questions asked. MULTI-UNIT DISCOUNTS: Scroll down to Special Offers for up to 20% off of today's order. 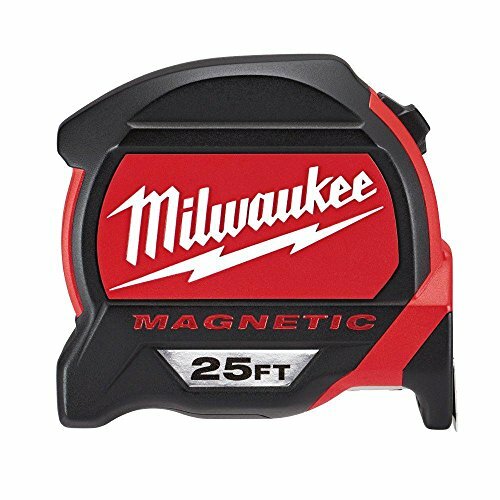 2 pack, 25' FatMax tape measure, extra tough & durable, 11' blade Standout, 1-1/4" wide blade for easy readability, blade Armor coating on the first 3" maximizes durability of the blade, Mylar polyester Film extends the life of the entire blade, high-impact ABS case with durable rubber hold up to heavy use, top forward blade lock makes locking & unlocking easy, 16" & 19.2" stud center marking simplify framing jobs, cushion grip provided comfortable, slip resistant hold, specially designed multi-catch hook grabs on top or bottom for versatility, 3 rivet, corrosion resistant Tru-Zero end hook for accurate measurements. 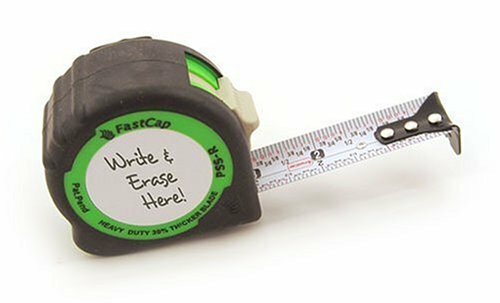 FastCap's original line of tape measures feature a built in Fastpad for jotting down measurements, a compact design, and a heavy-duty protective rubber boot. The ergonomic belt clip and built-in pencil sharpener are features that our customers have requested for years! The blade on this tape is one inch wide and is designed with a four rivet nose clip that will handle the wear and tear of daily use. Available in 16' or 25' lengths in a variety of increments, including both standard and metric. Easy to read scale is identified down to the 1/16". 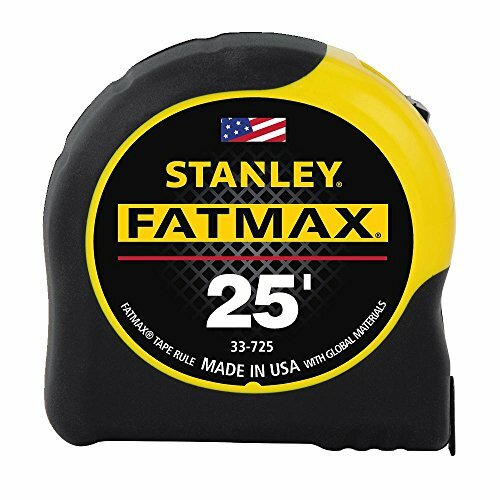 FAT MAX TAPE RULE 1-1/4 wide 11' standout Contractor grade Mylar coated blade Plastic case with rubber non-slip grip Belt hook Clamshell 25' Long Amazon.com The Stanley 25-Foot FatMax Tape Measure is reinforced on the first three feet with BladeArmor coating for maximum durability. A Mylar polyester film extends the life of the entire blade. This tape rule comes with a cushion grip built into the case for a non-slip grip and impact resistance. A top forward blade lock design makes it easier to lock and unlock the blade while a heavy, heat-treated spring provides long life and smooth blade recoil. Tape Rule is reinforced with BladeArmor coating for maximum durability. See the full line of Stanley tape rules. Hand tools for the pro or expert enthusiast. view the FatMax product demo (requires Flash) The tape blade measures 25-feet-by-1-1/4-inch with a 11-foot tape standout. To simplify framing jobs, the bright yellow, easy-to-read blade has 16-inch and 19.2-inch stud center markings. It comes with Stanley's limited lifetime warranty. 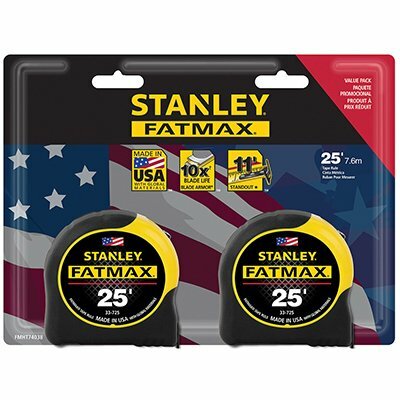 About Stanley FatMax Tape Systems and BladeArmor Coating The FatMax family of products has established itself as one of Stanley's most extensive and innovative product families in the company's 161-year history. The FatMax line of hand tools features core tools essential for the pro or expert enthusiast who desire high quality, durable tools. BladeArmor coating is a patented industrial thermoplastic coating, the very same material that has been used to strengthen and protect aircraft parts, such as the rotor blades on the Sikorsky Black Hawk Helicopter. Simply put, it helps aircraft survive war zones, and it also helps tape blades survive construction zones. Applying BladeArmor coating to tape blades reduces both tape breakage and tape returns, enabling it to conquer the toughest testing ground of all -- the job site! 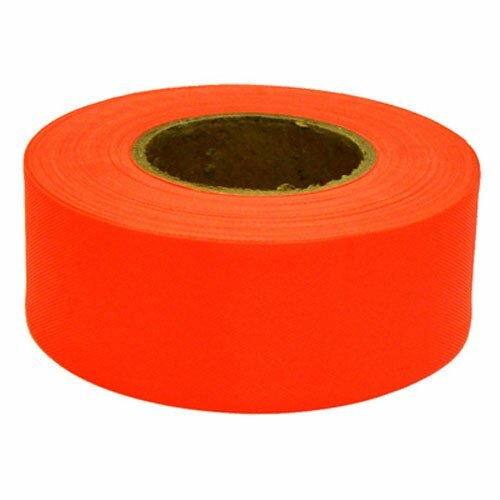 Tape rule with first 3 feet reinforced with BladeArmor coating for maximum durability. Out with the OLD and in with the NEW! 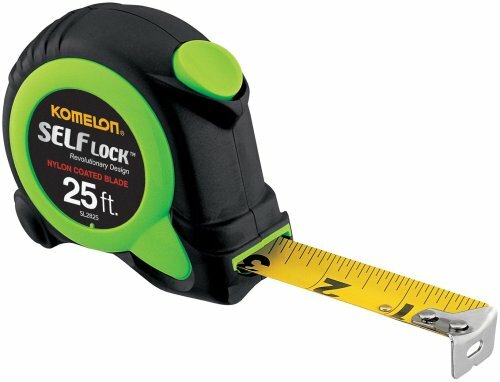 Komelon is taking the traditional chrome tape measure and bringing it to the next level. Each tape features an ergonomically designed chrome case, slide lock, and vibrant hi-visibility nylon coated blade. 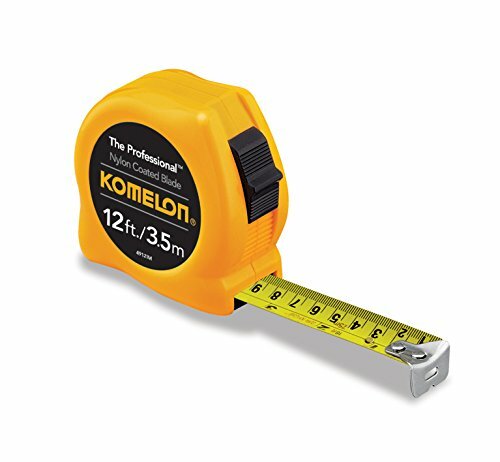 It's time for a bright new tape measure with Komelon's Hi-Viz Professional! You'll see and feel the quality. and interior designers to professional handyman, carpenter, metal or wood workers and architects. For the ulnar claw, increased TPR soft rubber protection and magnet. Have inch and metric measures on the tape. You can read clearly and quickly anytime. Mounts on work benches, saw tables, drafting tables, etc. Tylon coated blade that is corrosion resistant with bi-material case for improved grip and positive blade lock for accurate measurements.